Global Cross often encounters challenging missions opportunities in countries where Christianity is illegal, where people are suffering from extreme poverty, or both. Out of these situations are born creative approaches to Christian missions. Through Business as Missions (BAM) applications, we connect and partner with successful business leaders around the world in creating legitimate, for-profit business applications that in-turn support kingdom work and incubate and engender discipleship. We prayerfully accomplish this by launching a Global Cross start-up team specialized in cross-cultural assessment, Christian business principals and practices, church partnerships, communications, global sourcing, marketing, and networking. BAM is a great way to model individual responsibility, discipline and stewardship while shining the light of Christ. Likewise, BAM can be of value on many levels, such as providing legitimate, legal opportunities for Christians to be in certain hostile countries, and creating economic benefit to struggling communities. Contact us if you would like to know more or join us in this ministry! Global Cross sent a team member to Ethiopia to assess BAM opportunities and has identified two projects. Ethiopia has a population of nearly 100 million people. It is the second largest country in Africa and the second fastest in population growth. Between 2010 and 2014, its economy has grew at an impressive rate of 10% annually. However, Ethiopia has a few challenges. Only 3% of the population use a smartphone and/or tablet. Only 2% of rural residents have access to electricity and a majority of Ethiopia is rural. Only 1% have access to the internet. Most of the population lives in poverty. Global Cross is seeking God's will in Ethiopia. We are evaluating BAM opportunities regarding rural energy with our partner AEG and their Firefly solar charger. We are also looking to the mobile market to see if it is a good match for the Parchment smartphone or tablet. We have started the first phase of our project and are distributing tablets and solar chargers to Doctor of Ministry students in August 2016. We have identified several government, business, and ministry partners to evaluate in the upcoming phases. We will meet with met with many of them when we travel to Ethiopia in August. Joe Harding of SIM meets with Doctor of Ministry students who are participating in the Parchment project. Ethiopia offers one of the most coveted coffee beans in the world, however farmers are struggling because a lack of distribution channels has driven down their sell price. Global Cross believes it can help Ethiopian farmers by providing infrastructure, branding, marketing, and importation and distribution within the United States. We have identified several business partners and continue to move forward with God's leading. Global CRoss Director Jeff Risk standing in a coffee field with farmers. Cabinets & Coffee is our first American BAM application. The purpose of Cabinets & Coffee is to conduct business while practicing Mathew 6:33. From a business perspective, Cabinets & Coffee offers homeowners, contractors, and designers a collection of cabinetry, countertops, lighting, flooring, and window treatments. The company strives to love its customers through excellent customer service, similar to how Jesus loves. Within a Kingdom context, Cabinets & Coffee strives to provide Bible studies for men in a non-church setting, partner with local churches in their service area, distribute coffee from missionary-focused areas, and fund domestic and international discipleship. Global Cross has been involved in missions in Nicaragua for several years. These missions range from evangelism and discipleship to building homes for those in need. We felt God calling us to create a business in Diriamba to provide employment for believers and but also so they could provide for their ministry. In the past, 100% of the financial resources came from donors in the United States. Today, the Ascensor project is providing for the Christ followers, their families, and their ministry in the community. 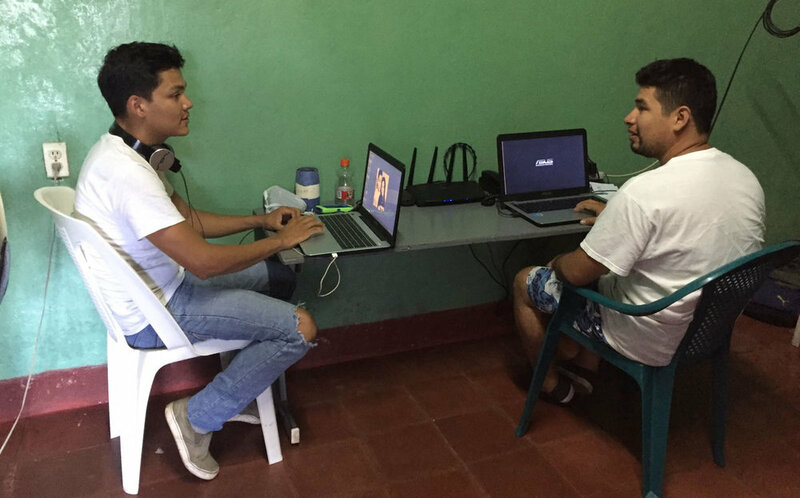 We did a retrospective on the first 18 months of our Business As Mission project in Diriamba if you would like to read more. For security reasons, it is difficult for us to share details about our efforts in Asia. However, we can say we use our business contacts to gain access to the underground church in several areas. We distribute Christian resources and Biblical training to support the persecuted disciples in those areas. Our Parchment tablet and microSD cards make it possible to hide and quickly distribute those material. Click below if you would like to contribute to this project.